Have you recently been on your drchrono dashboard and wondered what ‘Flags’ are? Well look no further! I have the answer for you right here: flags are a really cool feature with both our drchrono website and our iPad EHR. It’s a useful tool so that you can be immediately notified with important information about your patients for every visit. Do they have any medication allergies? Are they afraid of needles? All of these can be easily found in the ‘Flags‘ link under the demographics tab on our drchrono website. Next, click on ‘+New Patient Flag.’ Be sure to list the flag as a category, such as: allergy, sensitivities, important or how ever you want to categorize your flags. Choose a color, and then click ‘Add.’ You can add, edit or archive your flags at any time through this section. To add a flag to a specific patient click on the ‘Flags‘ link under the ‘Demographics‘ tab. Choose your category from the categories you created through the ‘Patient Flag‘ section. You can now add a specific description for each patient under the specified category. 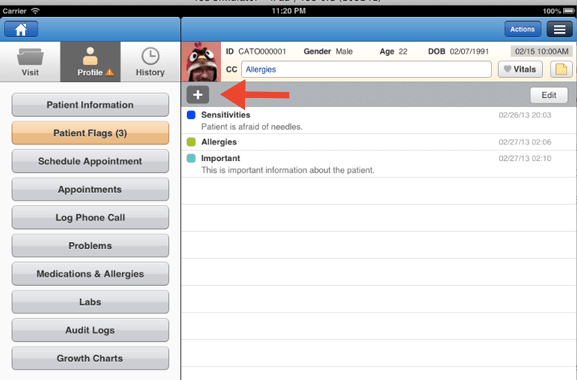 You can also view and add specific patient flags through your drchrono AP on your iPad. Simply click on the ‘Menu‘ icon to search for the patient you would like to add a flag for. Simply click on the ‘Profile‘ folder located to the right, click on the ‘Patient Flags‘ tab, click on the ‘+’ icon and select the corresponding category flag that you previously added through your drchrono website. To create a flag for a patient that has an appointment for the day, click on ‘Patient Chart,’ click on the ‘Profile‘ folder, then click on ‘Patient Flags‘ and add a new flag for the patient. Whether or not you create a flag for a patient on either the website or the iPad AP, your patient flags will appear on both platforms. To view flags for a patient who has an appointment for the day, the ‘Flags‘ tab is conveniently located at the top of their profile. Once you click on the tab, you will see a full list of the patients flags.